Fun awaits your preschooler at the KidsWorld Clubhouse! Kids will join Spot and friends for a week of exciting games, crafts, Bible stories and more! Must be at least 3, 4 or 5 years old by the start of camp. Must not have completed Kindergarten. Must be fully potty trained at time of registration. 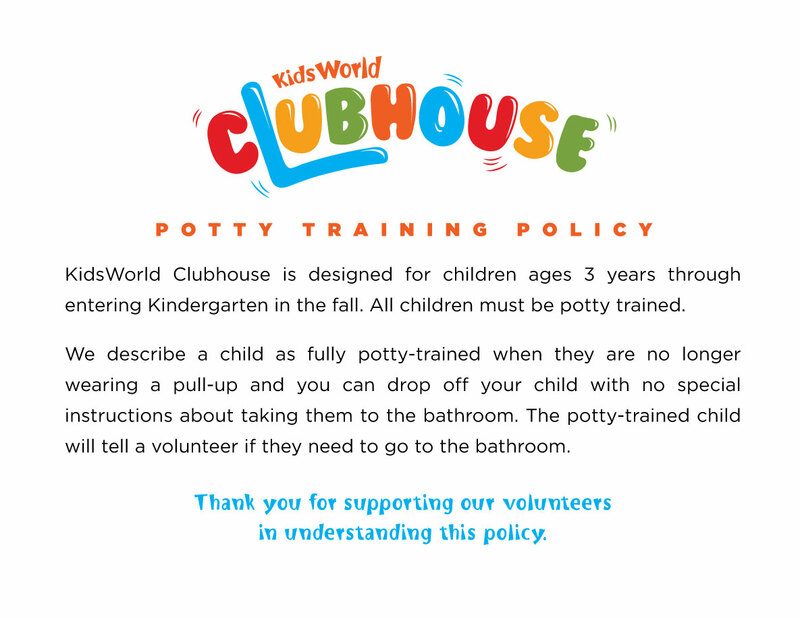 Please read what it means to be fully potty trained here. Interested in volunteering? There are lots of ways you can use your gifts and talents at KidsWorld Clubhouse! Child care is available for volunteers who have children under 3 years old. Click here for a look at all the opportunities! Interested in volunteering? There are lots of ways you can use your gifts and talents at KidsWorld Clubhouse! Child care is available for volunteers who have children under 3 years old and 1st-5th graders. Click here for a look at all the opportunities!